A red sandstone building of the mid 19th century, built by the Duke of Buccleuch for his hunting friends. Now a good place to stop off for a pub lunch. Creative Commons Licence [Some Rights Reserved] © Copyright Gordon Hatton and licensed for reuse under this Creative Commons Licence. It was April 2012 and we were on a drive south – starting at the Glenspean Lodge in the Highlands, we drove along the A86 (the old General Wade’s Military Road in parts) towards Fort Augustus and Loch Lochy, then on the Loch Ness, Inverness, Culloden and then south. We were hoping to make Newcastle ((we have an Australian view of distance so not only were we driving but we also stopped along the loch for a wee bit of lunch and a view over then loch and then stopped at Culloden for a walk with the ghosts of that battle)) but by the time we got to St Boswell’s on the border, we were feeling a wee bit knackered so stopped for a pint and a comfortable bed. 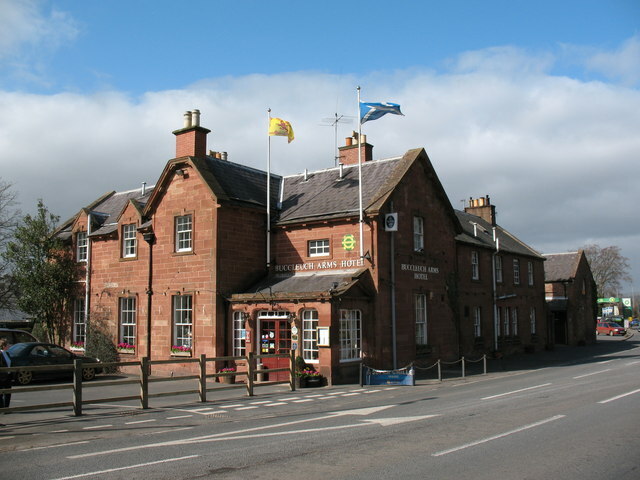 We stayed at The Buccleuch Arms Hotel in St Boswells where we had a very pleasant chat with the owner over a couple of pints and then a couple of drams … just to help you sleep mind. Both the Glenspean Lodge and the Buccleuch Arms are places we will happily stay in again, The scenery around the Glenspean Lodge was simply marvellous. The whisky at the Buccleuch Arms was also simply marvellous. The lady also enjoyed the black pudding served at breakfast there. It was wonderful today to to see that the Buccleuch Arms had won the award for the Scottish Inn of the Year 2013. Just for the record, the Glenspean Lodge has a brace of awards from the 2010 Scottish Hotel Awards. We happily recommend, both establishments which interestingly were both hunting lodges. I should note that the next days drive was from St Boswells to Stonehenge and then back to Heathrow Airport.